Austria’s Raiffeisen Zentralbank and Andritz should follow Deutsche Bank’s example and pull out of all involvement with UFS’s socially and environmentally destructive pulp plans. By Chris Lang. Published in WRM Bulletin 102, January 2006. United Fiber System’s plans to build a pulp empire in Kalimantan received a blow in January 2006, when Deutsche Bank confirmed that it has pulled out of its role as financial advisor to UFS. Five months ago, UFS announced that it had appointed Deutsche Bank’s Singapore Branch as Financial Advisor on a proposed acquisition of the Kiani Kertas pulp mill in East Kalimantan. Michael Hoelz, Deutsche Bank’s managing director, confirmed in a statement to German NGOs that “Deutsche Bank no longer holds a mandate with UFS”. Deutsche Bank pulled out after pressure from urgewald, Robin Wood, Rettet den Regenwald and Global 2000 (Friends of the Earth Austria). In November 2005, Robin Wood activists hung a banner from Deutsche Bank’s office in Frankfurt. “We are convinced that customers and shareholders of Deutsche Bank would not agree with the Bank’s involvement in business that destroys the rainforests,” said Robin Wood’s Peter Gerhardt. The 525,000 tons-a-year Kiani Kertas pulp mill was set up by the now-disgraced timber baron Bob Hasan. Hasan was a government minister and close friend of Indonesian dictator Suharto. After Suharto’s fall, Hasan was jailed for corruption. Kiani Kertas has never run at full capacity and ran up a debt of more than US$1.1 billion. Stephanie Fried, a senior scientist with Environmental Defense, spent two years in the early 1990s living with the Bentian Indigenous People in East Kalimantan. 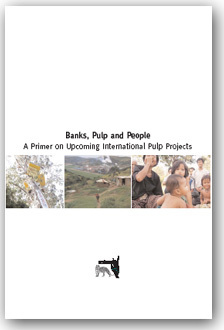 She has documented the environmental and social costs of how plantations in Kalimantan were set up[*]. The first thing that the Bentian people knew about the proposed plantations was from the sound of chainsaws in their family forest. The company destroyed their gardens, fruit trees, and forests. Workers bulldozed and looted Bentian ancestral graves. The company took any good timber and between 70 to 80 per cent of the land was just burnt and abandoned. The company gave no compensation. One group of people from the Menamang region went to a company nursery asking for a discussion with the Sumalindo company which was setting up plantations there[**]. Instead of company representatives, about 200 military personnel turned up. They took the Bentian prisoner, tortured them, forced gun barrels into their mouths and ears, burnt them with cigarettes and threatened to kill them. In addition to its plans to take over Kiani Kertas, UFS plans to build the Satui pulp mill, a 600,000 tons-a-year mill in South Kalimantan and a 700,000 tons-a-year wood chip mill on Pulau Laut, an island off the southeast coast of South Kalimantan. 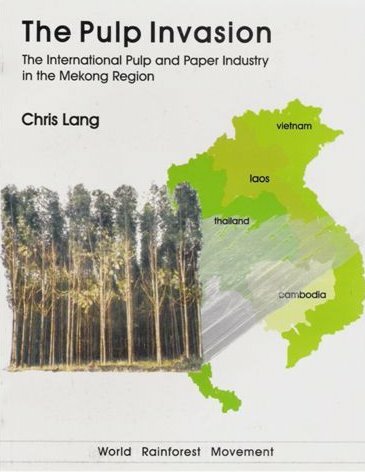 In 2002, UFS signed a contract to build the Satui pulp mill with China National Machinery and Equipment Import and Export Corporation (CMEC), a Chinese state-owned enterprise. Under the contract CMEC will finance 80 per cent of the project while UFS is responsible for the remaining 20 per cent. Two years ago, the chairman of UFS, Sven Edström, told researchers from the Centre for International Forestry Research in Bogor, Indonesia, that he knew nothing about CMEC’s environmental record. In fact, CMEC has never before built a pulp mill. In late 2003, UFS applied for political risk insurance from the World Bank’s Multilateral Investment Guarantee Agency (MIGA). After an NGO campaign UFS withdrew the application to MIGA. In 2002, a subsidiary of the Dutch firm Akzo Nobel pulled out of the Satui pulp mill project shortly after Milieudefensie (Friends of the Earth Netherlands) protested outside the company’s head office in Arnhem. Construction of the UFS wood chip mill has started, with financing from CMEC and the Austrian bank Raiffeisen Zentralbank. Austrian pulp and paper machinery company Andritz has signed a contract with UFS to supply the machinery for both the wood chip mill and the Satui pulp mill. UFS is listed in Singapore and owned by a series of companies registered in the British Virgin Islands. One of the companies, Tektronix, is owned by the CEOs and Directors of Swedish based CellMark, the world’s largest marketing company for pulp and paper. CellMark has an agreement with UFS to buy 90 per cent of the output from the Satui pulp mill for the first ten years of operation. At a press conference in Frankfurt in January 2006, NGOs welcomed Deutsche Bank’s decision to pull out of all involvement with UFS. Lydia Bartz of German NGO urgewald said, “Deutsche Bank should develop social and environmental standards” so that it can avoid getting involved in projects like UFS. Longgena Ginting of Friends of the Earth International explained that the problem is the huge overcapacity of the pulp and paper industry in Indonesia. More than three million hectares of forest a year is destructively or illegally logged – much of it to feed the pulp industry. “There is a very strong link between the financiers, consulting firms and machinery suppliers in Europe and the destruction of forests and livelihoods in Indonesia,” he said. Daniel Hausknost of Global 2000 added that Andritz and Raiffeisen Zentralbank are still involved in UFS projects. They should follow Deutsche Bank’s example and pull out. 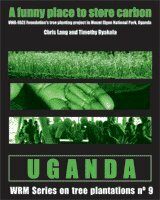 [*] Correction, 22 February 2006: This sentence previously stated that Fried had “documented how the plantations to feed the Kiani Kertas mill were set up.” The forests were logged by a Kiani company before the Kiani Kertas mill was built. See Fried’s note below for more detail. Stephanie Fried, a senior scientist with Environmental Defense, spent two years in the early 1990s living with the Bentian Indigenous People in East Kalimantan. 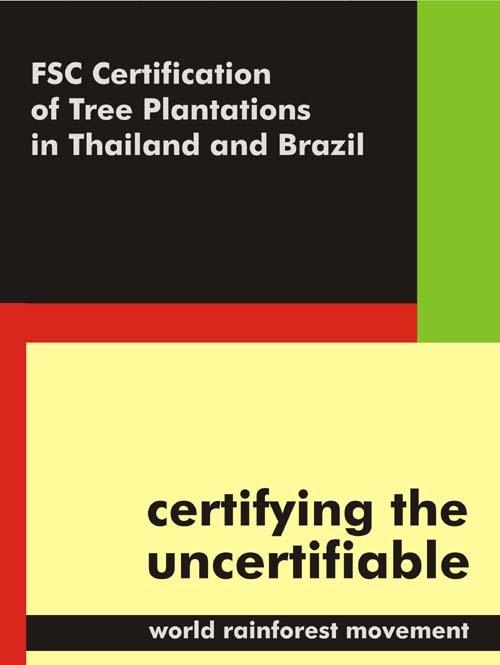 She disputed claims of the availability of existing “sustainable plantation timber” supplies for the proposed mills. Fried has documented the environmental and social costs of Indonesia’s so-called “plantation establishment” program, designed to circumvent Indonesia’s ban on the clear-cutting of natural forest and to provide a fiscal bonanza to logging companies making plantation claims. 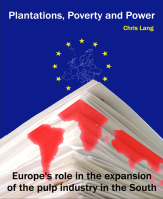 For example, if a company declared that it was “establishing a plantation,” it was eligible for access to “reforestation funds” and other fiscal benefits and received official permission to carry out “land clearing” (i.e. clear-cutting) – ostensibly on marginal, “unutilized”, or logged-over lands. In fact, however, plantation companies usually target primary forests or rich old growth forests managed and inhabited by indigenous communities, and make a fortune by clear-cutting and selling the old growth logs and harvesting the fiscal packages offered by the government. Most of these “plantations” are never actually planted, or are done so in such a careless manner that little harvestable growth occurs. 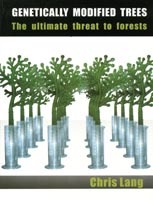 Fried documented the process of plantation establishment used by Bob Hasan’s Kalimanis Group/Kiani Lestari as an example of the way that the country’s most powerful, wealthy and technologically advanced company – builder of the Kiani Kertas mill – carried out so-called forest management and plantation establishment. Hasan’s company decided to target the rich indigenous-managed Bentian forests. The first thing that the Bentian people knew about the proposed plantations was from the sound of chainsaws in their family forests. The company destroyed their rattan gardens, fruit trees, and forests. Workers bulldozed and looted Bentian ancestral graves. With military backing, the company clearcut and removed any good timber and burned and abandoned the remaining land. The company gave no meaningful compensation. Fried also provided documentation of other human rights abuses commonly associated with the establishment of plantations, using the example of Sumalindo company’s Surya Hutani Jaya plantation in the Menamang region. Please note that according to Indonesian NGOs, Sumalindo plantations are likely to be supplying the Kiani Kertas mill. After the unauthorized bulldozing and clear-cutting of their ancestral forests, the people of Menamang tried repeatedly to meet with the company to discuss compensation and to limit future damage to their forests. One group of Menamang leaders went to the company nursery asking for a discussion with the company. Instead of company representatives, about 200 military personnel turned up for “war games.” They took the leaders prisoner, tortured them, forced gun barrels into their mouths and ears, burnt them with cigarettes and threatened to kill them if they told their story. Sumalindo plantations were “established” and “landclearing” efforts led to massive forest fires which spread to a neighboring national park.